Black with glitter multi-color print in Pink, Purple, Green, and Gold. 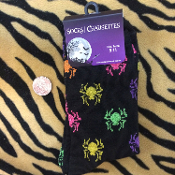 Unisex style socks fit women's shoe sizes 4-10. 95% polyester, 3% spandex, 2% metallic fibers.